Myke Bakker at work at Sauvarins Coloured Glass Studio. Chance is a fine thing. When Myke Bakker’s mother decided to do a leadlight course when he was a high school student and brought the tools home, she unwittingly set on course a chain of events that would influence the direction of her son’s life. Fourteen years later, Myke is still intrigued by the many possibilities of working with glass and he’s made a career out of it in the process. 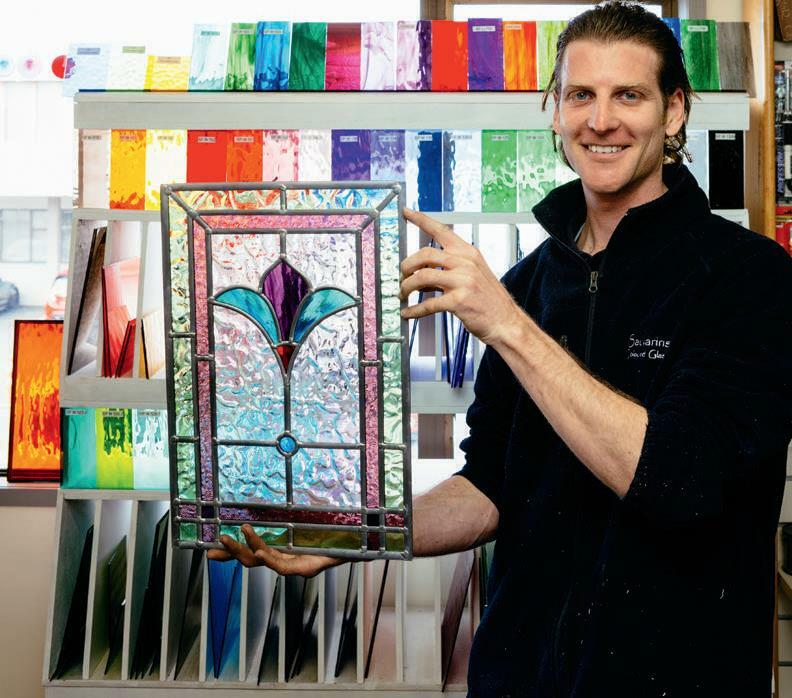 He is one of a small team who work at Sauvarins Coloured Glass Studio in Auckland’s Penrose specialising in all things glass. 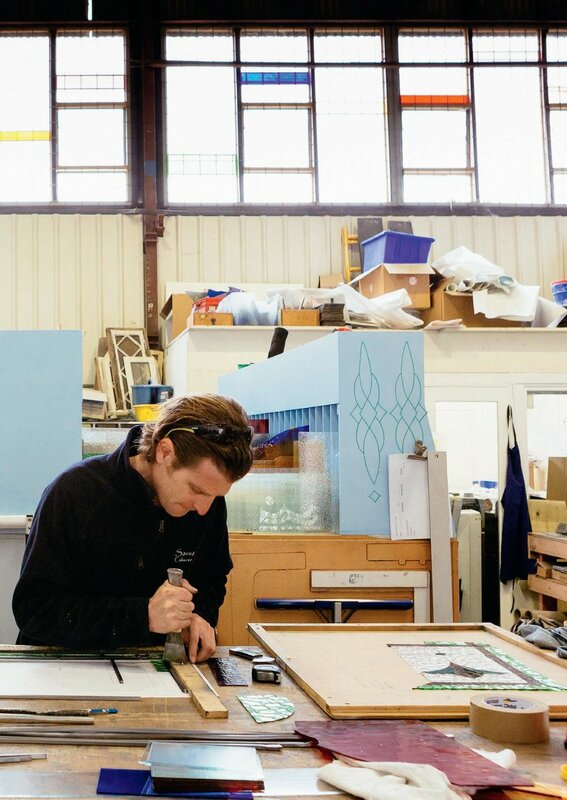 The studio has glass stacked in storage cabinets, old glass windows lean against the walls and wide work benches accommodate all the work in process, from restoring heritage leadlights through to new commissions. Upstairs in the showroom, a rainbow of vibrant glass samples signal the huge variety in colour, finish, texture and style of glass available, from modern swirls of bright colour through to the more subdued modern replicas of vintage-style glass. Then there’s the etched, silvered, antiqued and fused examples…there seems to be no limit to the effects that can be achieved. Working with glass in all its forms involves a very precise skill set but there are some principles that are relatively easy to grasp and master. 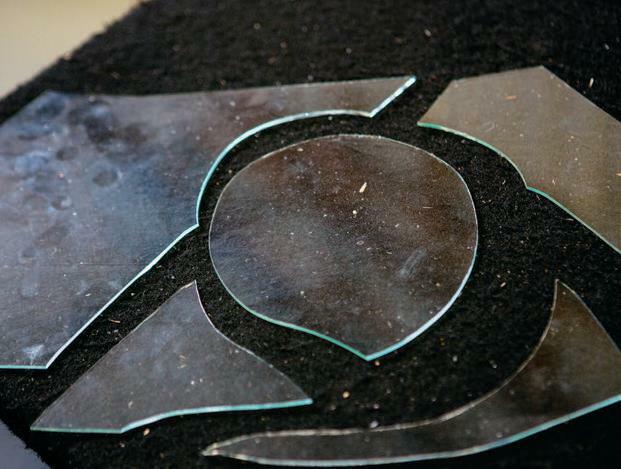 The design used to cut the glass pieces and assemble the panel. Using the square as a guide to cut the glass. Tapping the glass along the score line. Snapping the glass by hand. Sauvarins shares their passion for glass during the eight-week courses they run which teach the fundamentals of making a leadlight. The classes are limited to six people and concentrate on making one finished leadlight panel so that at the end of the course students have something to show for their work. “The workshops incorporate all the elements students need to make a window,” says Myke. “The pattern the students use has been designed by Sauvarins to include square joints, mitres, curves meeting curves and a circle. This provides a really good grounding in the elements that students need to continue with their own designs. 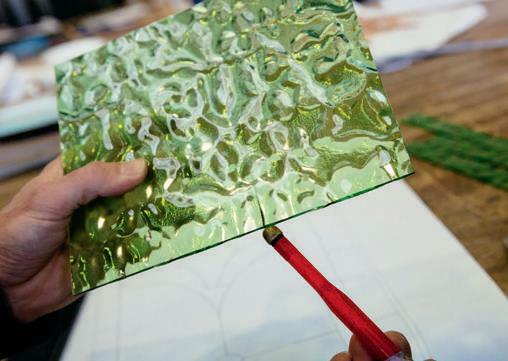 To offer individuality of the panels the students select the colour and texture of the glass they are using for their project. Myke takes us through the process of making a leadlight panel using the same design that is used in the workshops. 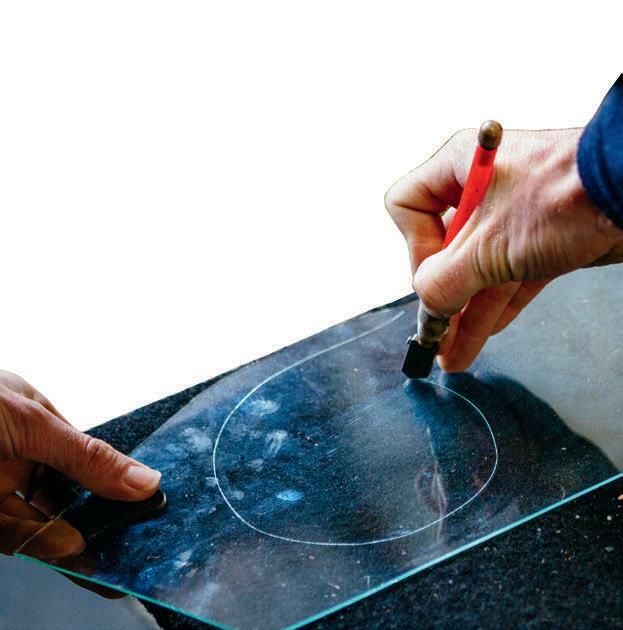 The first step in making a leadlight panel is to draw up your design. This will be used as a guide for cutting and assembling the leadlight. 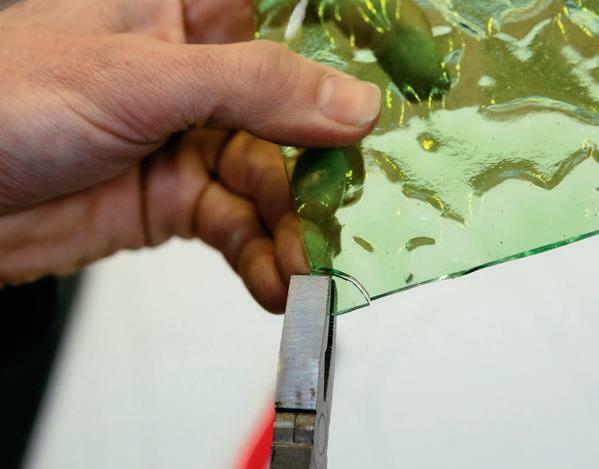 The main consideration when cutting the glass is to allow for the heart of the lead came that holds the glass pieces in place. Allowing for the lead came "heart". Using the grozier pliers to snap part of a circle. Also it is important that you are a stickler for hygiene after handling the lead—staff at Sauvarins are vigilant about washing their hands thoroughly before entering the lunch room or leaving the work studio. Starting to cut a circle freehand. The circle cut and ready for finishing. Bench height is the key to making the process of cutting glass easier. At the studio, staff work on a low, felt-covered table to cut glass, especially when making trickier cuts such as circles and curves. Once the glass has been scored most pieces can be broken out by hand. 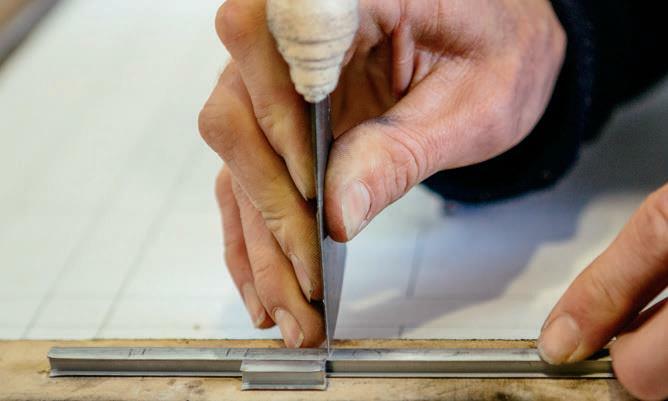 Straight pieces can often be “snapped” with pressure from you fingers, but in many cases—especially when dealing with shapes like circles and curves—special grozing pliers are used to snap off the piece from the score. The ball on top of the glass cutter can also be used to tap on the back of the score to get the break started. Grozier pliers have a flat top jaw and a curved bottom. Normal pliers can’t be used for the job as they crush the edge of the glass. Cutting and laying up the panel. Once all the rectangular and square glass pieces of the double border have been cut, Myke moves on to cutting the more tricky feature pieces that form the inside of the panel. These are cut free hand. Although they do have a special jig for cutting circles, Myke says they tend to only use this for bigger jobs as it takes time to set up accurately and it’s faster to do by hand for small jobs such as this. The cut starts as a straight line and then the curve is scored. Once cut all the way round, relief cuts are made on a tangent. The score is then tapped and the grozier pliers are used to snap off segments of glass leaving the central shape. 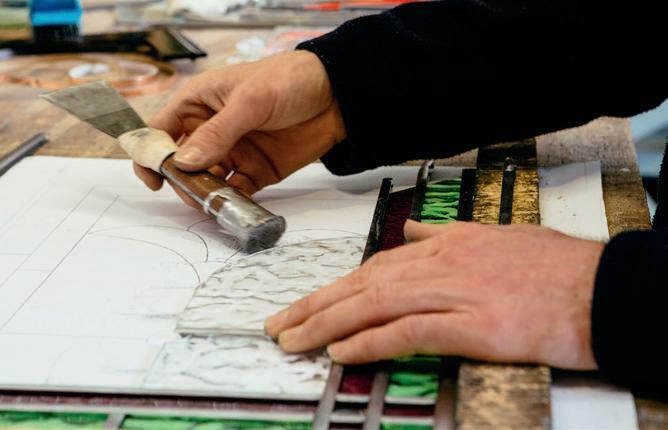 Once all the pieces that will form the decorative panel have been cut, the painstaking process of assembling the leadlight begins with cutting to an accurate size the lead sleeves that will hold the glass pieces together. Before starting on cutting the lead, Myke nails down wooden battens called laths in an “L”-shape. “You build the pattern against the lathe so the wood you use needs to be reasonably thick. You can never trust a pattern is square as it changes shape as you work on it. I use a builder’s square when setting the laths to make sure the angles are true. The lead came showing the "heart". At Sauvarins they have a custom-built lead stretcher for the job but Myke says for the hobbyist a sailing rope cleat that you can get from a boat chandlers attached to a wall is just as effective. 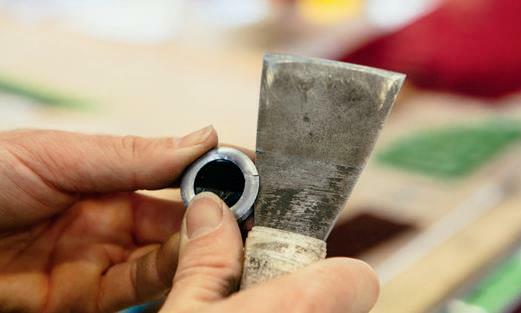 The knives they use for cutting the lead consist of a cut-down scraper sharpened to a razor edge with a leaded hammer handle which can be used for gently tapping the pieces home into the lead without smashing the glass. …then turning it over and making a straight cut. Using a piece of lead as a marker to cut equal lengths. 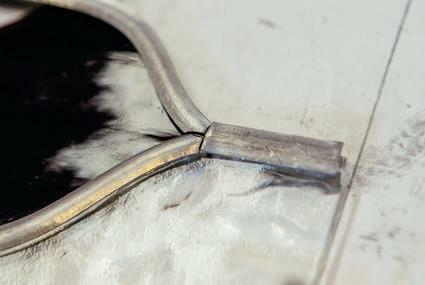 Tapping a glass piece into the lead. Myke starts with cutting the lead for one side of the double border first. As the pieces are regular he cuts one piece to size, then lies the piece on top of the lead and uses it as a guide for marking off the other pieces that need to be cut. Once the glass is all in place this should help to achieve a nice straight border. The end pieces are cut on an angle to allow for the width of lead on a side angle. Myke uses a small piece of lead as a gauge so he knows where to cut. Nailing a piece of lead against a piece of glass to help keep panel pieces in place during assembly. …and fitting it in place. …and allowing for the “heart” of the lead. Once the lead and glass is all held in place to the pattern two more wooden laths are nailed down to hold the whole panel square ready for soldering. The flux used at Sauvarins is Steraine (solid rendered animal fat) and is applied on every joint and anywhere you want the solder to flow. Myke smushes the flux with his finger to make sure the area is thoroughly covered. Sauvarins use gas soldering irons but Myke says cheaper electric soldering irons are perfectly adequate for hobbyists. The process is to just wipe off a bit of solder onto the iron, place it straight down onto the joint and, once the solder has flowed over the joint, lift the iron tip straight up. Once all the soldering has been done on the first side, the lathes can be removed and the panel is turned over and the other side is soldered. All that’s left is the cementing and polishing… most students leave this mucky process to the team at Sauvarins to complete for them. Leadlight cement is pushed between the lead came and the glass on both sides using a stiff bristle brush. After each side is cemented whiting powder is sprinkled over the panel and is left to dry for a few hours and then the excess cement is scrubbed off. After about 24 hours the lead came on both sides are polished with Neil’s Black Stove Polish. 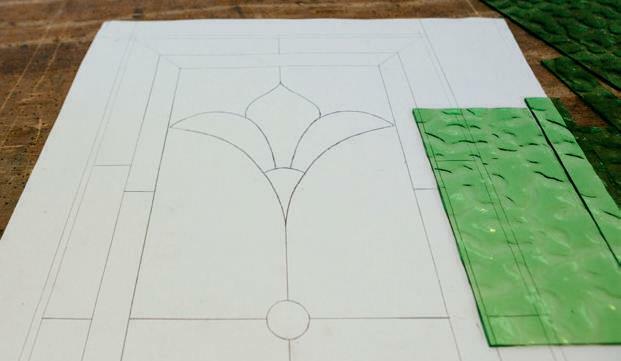 Then—voila—a finished leadlight panel and the foundations of an understanding of the art of making leadlights. Myke with the completed leadlight panel. Sauvarins imports glass directly from America, receiving shipments every few months. There are two main brands of glass that each have very distinct qualities. “The Spectrum range is characterised by bright, almost lolly-like colours,” Myke explains. “The Wissmach range has more subtle colours that are suited for matching with the kinds of old glass found in villas. It’s harder to work with and can be quite unpredictable. “We hoard as much old glass as we can find. Sometimes people come and give it to us. Sometimes we get glass from demolition yards but they generally want us to buy the whole frame, which is of no use to us, so it’s often not a very cost-effective source. Myke set himself a bit of a challenge recently when he decided to make a textured mould to replicate the vintage patterned glass known as “Imperial”. “It features tudor rose, thistle, leek and shamrock forms. I made a mould from plaster of Paris and silicone. I had a few failures along the way. On one attempt gas was released from the mould material which caused large bubbles in the glass. It’s extremely difficult to take a mould off glass. It took me around eight tries at it. Eventually I’d like to make a mould big enough to take the largest sheets of glass.” The company recently expanded to include a custom silvering business. As well as “mirroring” anything made of glass, the process can be used to create special effects. 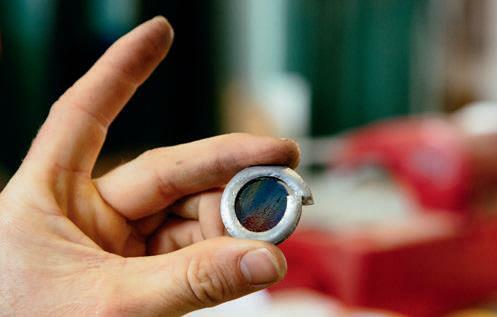 “When coloured glass is silvered it becomes iridescent. Things have to be kept fastidiously keen on every step of the process. It’s really effective on mosaics and things like splashbacks.” An “antiquing” look is achieved by interrupting the silvering process to produce the mottled, aged effect that distinguishes real antique mirrors. Fused glass is another aspect of glass that Sauvarins runs classes on. Myke points out a distinctive little banana-shaped platter that looks as if it may be made from a material like porcelain rather than glass: “It’s made from sheet glass with stringers fused into it to create the pattern. The glass is slumped into a mould to bend it,” he explains. 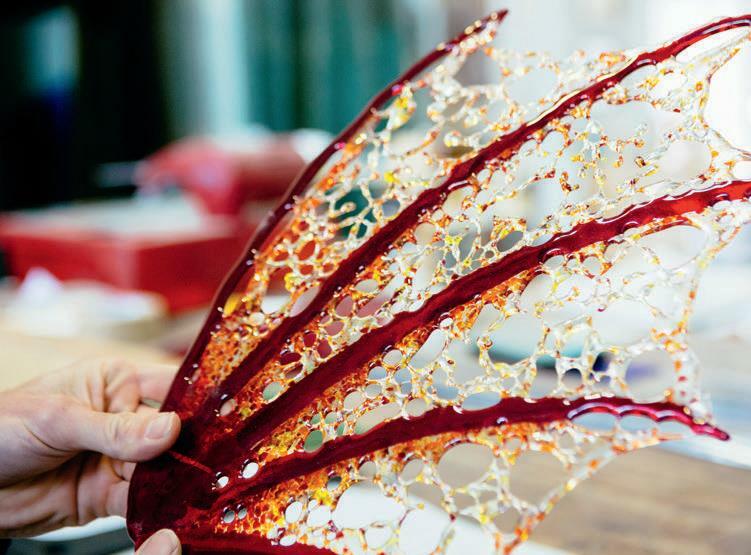 Always keen to experiment with new techniques, Myke’s current challenge is trying to create authentic-looking dragon’s wings for a special project out of cut glass pieces that are fused in a kiln. “The cut glass pieces, or frit, are dusted over the kiln shelf and when heated the glass draws apart and fuses organically.” The frit form a solid but porous body, a little like delicate lace. The trick is to ensure the “holes” don’t get too big so the wing retains its structure and form.